Here at Soils Alive, we’re often called in to save plants in the landscape that are suffering from disease or pests. Sometimes though, what we encounter is a plant that is in decline for reasons that have more to do with its original planting or maintenance; the disease or pest it may be fighting is simply a result of poor cultural practices. We see this regularly in trees that have been planted too deep. There are many problems that can arise from planting a tree improperly. When plant roots are buried too deeply, the health of the tree will go into decline. Reduced vigor results in slowed growth rate, abnormal leaf shape and size, a suppressed immune system and reduced cold hardiness. The result of these growth abnormalities show up in decay, cracks, excessive deadwood or increased disease and pest pressure. Often, trees planted too deeply will show stress within the first year or two of planting. But, it can usually take several years before you will notice serious problems with your tree. The root collar is where the tree trunk flare transitions to the roots. There are typically a number of transport roots that radiate around the root collar and move water and nutrients that are absorbed by the smaller feeder roots. When a tree is planted too deep, this is the area that most suffers. Feeder roots require access to warmth, water and higher oxygen levels in order to thrive and perform their job. When buried too deep, oxygen levels are limited and roots will stop growing and then die. In an attempt to survive being planted too deep, roots will grow upwards and become very shallow. Or, the tree will attempt to develop new roots from dormant buds on the main trunk. You may also notice girdling roots around the base of the trunk. While some trees may be able to successfully adapt to being planted too deep, many simply can’t keep up and go into decline; especially in our heavy clay soils in DFW. Trees in decline with a limited root system become structurally unsound and dangerous. When the tree can’t properly support itself, it only takes one good storm to take it down or damage it irreparably. It doesn’t take much excess soil to put a tree into a stressed situation. Even just an inch of excess soil around the root collar can hide problems such as decay or root girdling. While a tree may have been planted properly initially, you can re-create the problems of planting too deep by piling mulch up around the base of the trunk and root collar. You should never mulch up against a tree trunk, as seen in this photo we took recently. 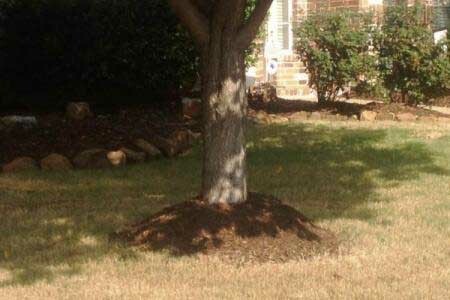 Mulch should always be placed in a shallow layer and burm away from the base of the trunk. When we visit your home to feed your landscape and trees, we will look for cultural problems such as planting depth or excess mulch and provide you with remedy recommendations. For more information about what we do here at Soils Alive be sure to check out our Services page.